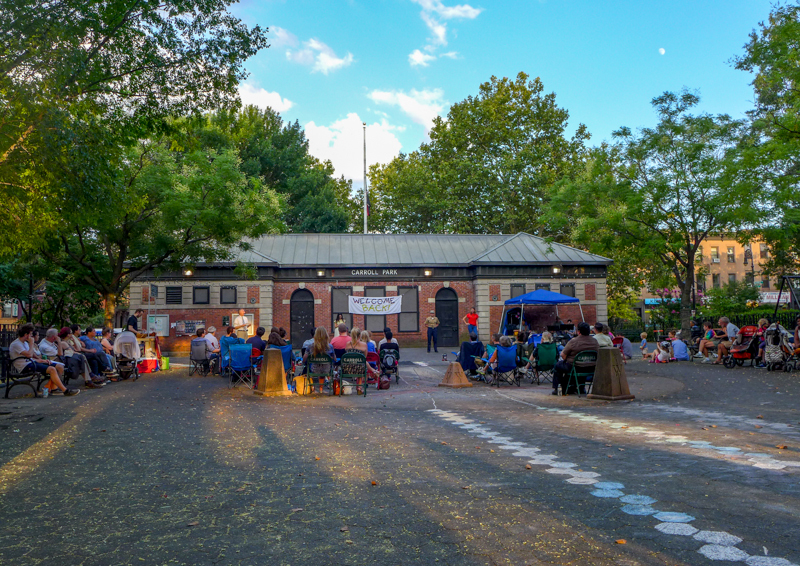 Outdoor theater is one of my favorite things about New York in the summer. 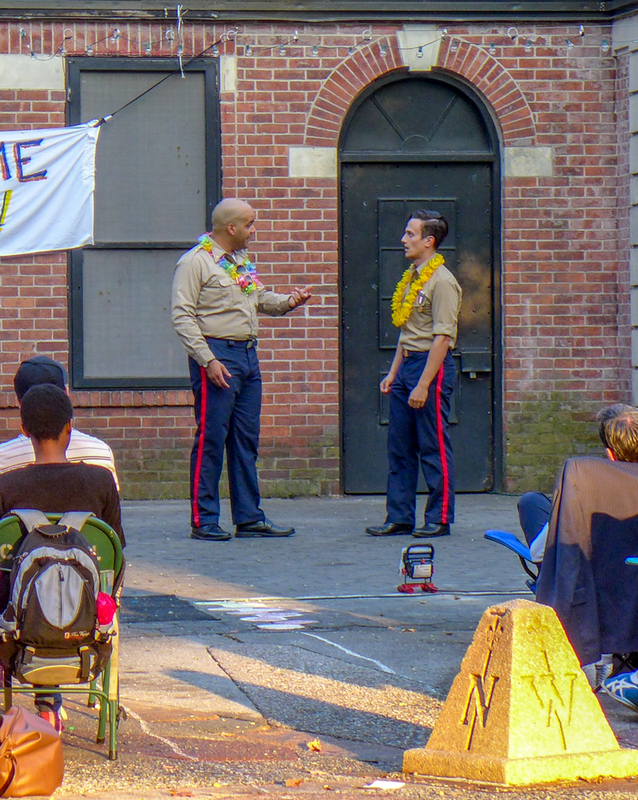 World-class acting in one of the city’s gorgeous green spaces… for free?! Why, yes please. 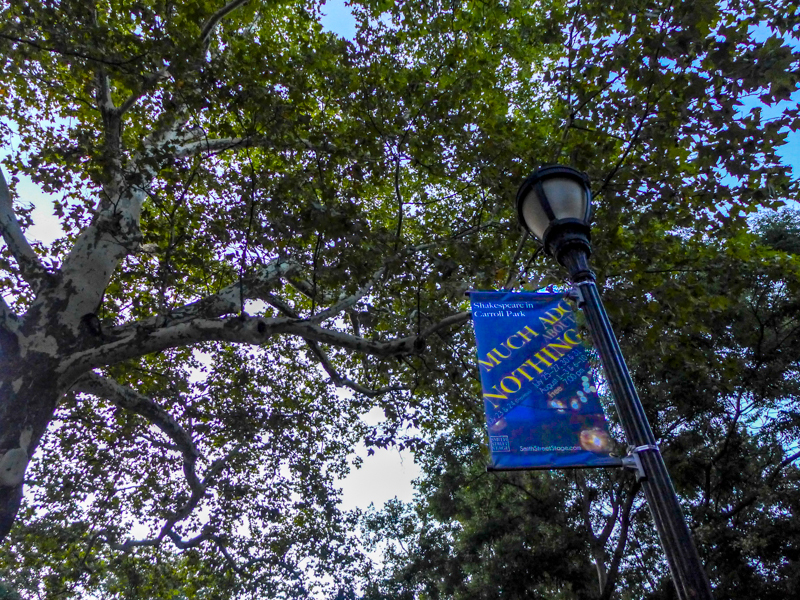 Last week I was leaving the subway at Carroll Street when I heard some hollers nearby and realized that Carroll Park, which is usually home to lots of wailing tots, was hosting a different type of dramatics: Shakespeare’s Much Ado About Nothing. So earlier this week, I headed there to watch the show. I took a blanket with me but it was more of a bring-your-own-chair do, so I squeezed into a bench near the back instead. Surprisingly their voices reached me – and I was soon swept up in the comedy, which was punctuated by rocking riffs from a live band. The play, which was put on by the Smith Street Stage, tells the story of four characters caught up in misunderstandings – Benedick and Beatrice, who are both tricked into believing the other loves them, and Claudio and Hero, who nearly fail to marry after Claudio accuses Hero of cheating on him. Plenty of overhearing and gossiping leads to lots of dramatic reactions and glee on the part of the other characters… but ultimately a happy ending. It’s really good fun. In this production, the leads shone – Benedick (David Pegram) had a lot of swagger but even more naivety, while a confident Beatrice (Alexandra Henrikson) tried to appear tough before coyly falling for everyone’s tricks. The rest of the cast gave the leads strong support – and us lots of laughs. 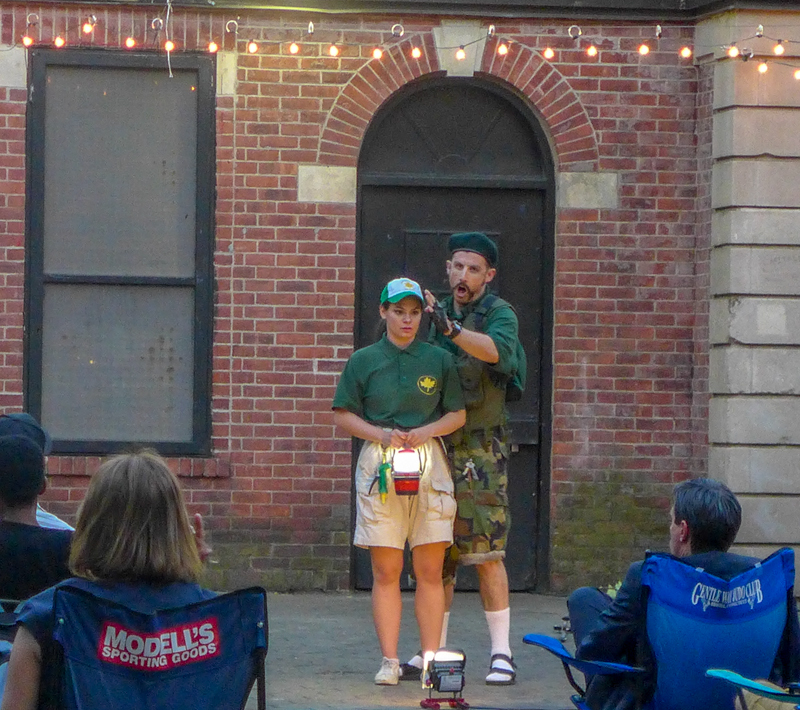 Although Carroll Park isn’t as green as other parks that host productions, I loved watching families and friends continue to buzz around the play as it unfolded. It gave the show an added sprinkling of energy and made me appreciate how fully the city parks are used. 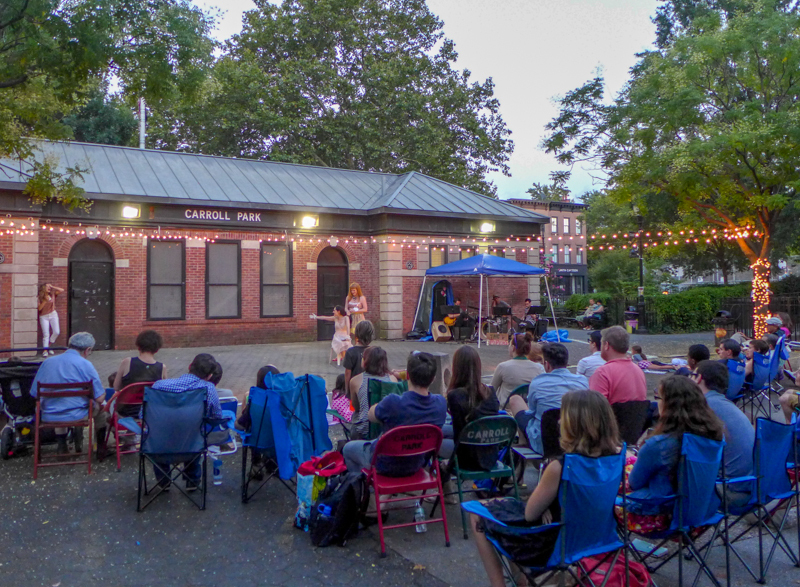 Of course, if Carroll Park is a little out of your way, then Shakespeare is popping up in different parts of the city – from Central Park (where John Lithgow is playing King Lear) to Park Slope (where Romeo and Juliet will be taking over a parking lot later this month). Let me know of any you’ve seen this summer that were particularly memorable. 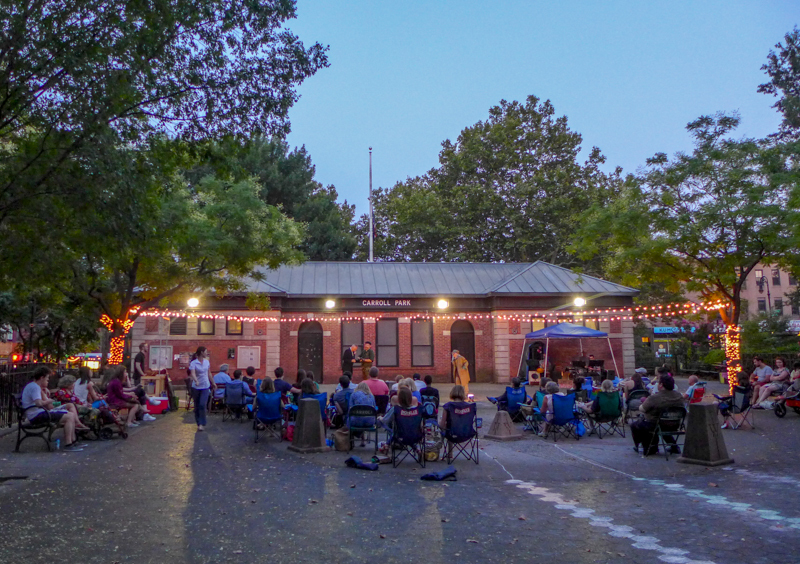 Most of the other outdoor Shakespeare productions have been and gone, but this one at Carroll Park is on for another week, so I encourage checking it out if you want your theater fix in a beautiful part of the city. For more info, see the Smith Street Stage’s website.